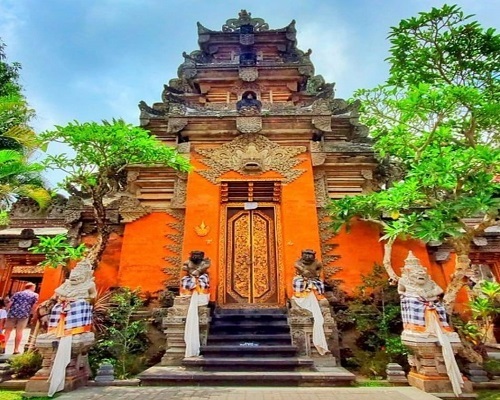 Bali Ubud Waterfall Tour Package is one of the waterfall tours we designed in Bali Half Day Tour Program by allowed you to encounter with the hidden waterfall of Tegenungan waterfall in Ubud village. Beside the waterfall also we will discover other tourist destination worth to visit. Is great opportunity to know about the Ubud Waterfall with name Tegenungan Waterfall. The duration this trip is half day by visit the Tegenungan Waterfall first at Kemenuh, This waterfall has height 35 meter from the land and also you allowed to swim in this waterfall. Then after finish admired the beauty of Tegenungan waterfall we will directly heading to Tegalalalang Rice Terrace, is rice paddy view scenery in norther of Ubud village, this place is the most stopped by the tourist during their trip to Kintamani Volcano Tour. Then after finish sees the amazing rice paddy view, we will directly to the center of Ubud to visit the beautiful resident house of Ubud King which known as the Ubud Royal Palace or Puri Saren and then we will visit the Ubud Market located right opposite the Ubud Royal Palace, in this market you can see the various handicraft. After finish visit all site during Bali Ubud Tegenungan Waterfall Tour we will go to restaurant for enjoy the delicious Indonesian lunch. After finish lunch we will drop you back to your hotel with bring a wonderful memory. Tegenungan Waterfall is the beauty and hidden waterfall in Ubud village, exactly located in Tegenungan Kemenuh town. Waterfalls are sharp drops along the course of a conduit, truly its a particularly lovely spot to stay in light of the way that green and nature home including. Typical scene around Tegenungan Waterfall is genuinely delightful, with green trees and beautiful. Near to the waterfall has been produced with a couple shower showers from normal springs. There are various steps go down to the stream if you may need to see the waterfall. 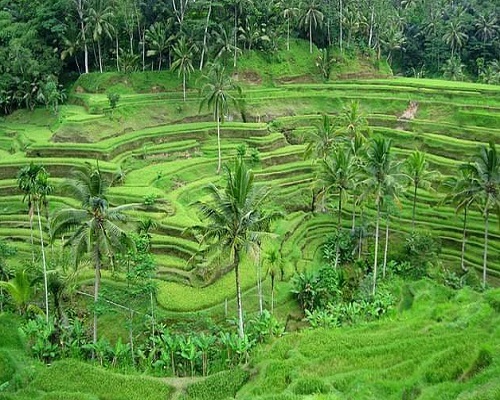 Tegalalang Rice Terrace is the famous rice terrace tourist destination in northern if Ubud village, this site is the most visited, has the beautiful view. This ancient valley has a timeless quality whether there are tourists there or not. Located ring in the main street from Ubud to Kintamani village and the most stopped place by the tourist for taking picture. You able to witness the beauty by do the trekking along the rice paddy and see how farmers works in the rice field. Is great background for tacking picture, our driver will more than happy can memories this moment in to picture, so you can remember all of your life time. Ubud Market is the center of economic trade in Ubud village, located opposite with the Ubud Royal Palace and is open from 08.00 am till 18.00 pm. The Ubud market has two building section which different function, one building is for local people which sell various food, vegetables and meat. Another building is section for the tourist, The art crafting are sold consisted of various crafting, from traditional until contemporary crafting. To get better price to buy handycraft in Ubud Market you will need skill of bargaining, if you talented, you can get better price.